The aim of the present review is underline the association between cardiac diseases and anxiety and depression. In the first part of the article, there is a description of anxiety and depression from the definitions of DSM-IV TR. In the second part, the authors present the available tests and questionnaires to assess depression and anxiety in patients with cardiovascular disease. In the last part of the review different types of interventions are reported and compared; available interventions are pharmacological or psychological treatments. Keywords: Anxiety, depression, cardiovascular disease, psychological risk factors, psychological treatments, psychocardiology, heart disease. It is known that in patients with ischemic heart disease, anxiety and depression are predictive of adverse short- and long-term outcomes [1, 2]. In fact, patients who have anxiety or depression during hospital admission are at increased risk for higher rates of in-hospital complications such as recurrent ischemia, re-infarction and malignant arrhythmias [3, 4]. They also suffer higher mortality and re-infarction rates months to years after their initial cardiac event [4-7]. Anxiety disorders and depression are among the most prevalent psychiatric disorders . Given the prevalence of anxiety and depression in the general population and in patients with Coronary Heart Disease [CHD], the potential public health impact for preventing the development and progression of CHD by appreciating the nature of the relationship between anxiety, depression and CHD is enormous . Thus, it is clinically relevant in patient with cardiovascular disease to assess the psychological profile and treat emotional conditions that confer an increase risk of major adverse cardiovascular events. Anxiety is a negative affective state resulting from an individual’s perception of threat and characterized by a perceived inability to predict, control or gain the preferred results in given situations . Several studies suggest a relationship between anxiety disorders and increased cardiac outcomes . Anxiety seemed to be an independent risk factor for incident CHD and cardiac mortality. Anxiety seemed to be an independent risk factor for incident CHD and cardiac mortality. The most recent meta-analysis  of references [1980 to 2009] on prospective studies of nonpsychiatric cohorts of initially healthy persons, in which anxiety was assessed at baseline, has shown as anxious persons were at risk of CHD [hazard ratio 1.26] and cardiac death [hazard ratio: 1.48], independently by demographic variables, biological risk factors, and health behaviors. In a much larger study , in subjects with no prior history of CHD, a dose-response relationship was found between phobic anxiety and coronary heart disease mortality [relative risk 2.5, 95% confidence interval 1.00 to 5.96]. Patients who are too anxious frequently are unable to learn or act upon new information about necessary life-style changes . Moreover a recent Swedish 37years longitudinal study  which have investigated the long-term cardiac effects of depression and anxiety assessed at young age [18-20 years] according to International Classification of Diseases-8th Revision [ICD-8] criteria has been shown as anxiety is an independently predicted subsequent CHD events. Observations have shown a hazard ratios associated with anxiety of 2.17 and 2.51 for CHD and for acute myocardial infarction, respectively, against a corresponding hazard ratios associated with depression of 1.04 and 1.03. More recently the study by Zafar etal. has examined, by a cross-sectional method, the effects of both depression and anxiety on platelet reactivity in a patient population with stable coronary artery disease. Findings show as subjects who were both depressed and anxious had significantly higher serotonin-mediated platelet aggregation compared with depressed-only subjects and subjects without affective symptoms. Anxiety and the mental stress associated with it contribute to excessive SNS activation and catecholamine release . The bidirectional association between mood disorders and heart disease is multifaceted, involving an integration of several central and peripheral processes. On the base of the whole these data Wittstein  hypothesizes potential mechanisms of biological pathways between anxiety and serotonin to enhanced platelet activation. As indicated by DSM-TR  depression is a clinical syndrome defined by the presence of five out of nine follow criteria during the same 2-week period: depressed mood, diminished interest or pleasure in daily activities, significant unintentional weight change, sleep disturbance, psychomotor retardation or agitation, fatigue or loss of energy, feelings of worthlessness or excessive/inappropriate guilt, decreased ability to concentrate, and thoughts of death or suicide. Depression is associated with a odd ratio of 2 to 7 fold elevated risk of subsequent cardiac events, which is comparable to traditional cardiovascular risk factors such as hypertension [19-22] and this require a particular attention for the diagnosis. The diagnostic difficulty of the depression in cardiac patient is due to atypical clinical presentation of depression in this patients and this explains the elevated percentage under-diagnosis of depression among cardiac patients. In 2008 the American Heart Association recommended [and the American Psychiatric Association endorsed] that “screening tests for depressive symptoms should be applied to identify patients who may require further assessment and treatment” if appropriate referral for further depression assessment and treatment is available. Depressive symptom dimensions after myocardial infarction [MI] may be differently related to prognosis. Somatic/affective [e.g., fatigue, sleep problems, and poor appetite] dimensions appear to be associated with a worse cardiac outcome than cognitive/affective dimensions [e.g., shame, guilt and negative self-image]. Specifically somatic/affective symptoms of depression [odds ratio: 1.49] it has been observed  to be related to a higher Killip class and mortality during the follow-up [12 months] period [odds ratio: 1.92]. These findings, which are in concordance with earlier studies [24-26], put further light on possible behavioral pathways which could explain the relationship between depressive symptoms and prognosis in ACS patients via unhealthy behavior, like smoking, less compliance, unhealthy diet and inactivity  and lack of physical activity . Recently the American Heart Association [AHA], the American College of Cardiology, and the American College of Physicians highlight the need to adopt validated and easily performed screening test for depressions and anxiety in patients with cardiovascular disease [29, 30]. Physicians have to be acknowledge that the psychological risk is not uniform across all patients and that psychological factors might cluster together within individuals . Currently, these individual differences are largely ignored in clinical research and practice, but they could be assessed with brief and standardized self-report measures and would do away with a single risk factor approach . The Beck Depression Inventory [33, 34] is a self-report measure has 21 items grouped by diagnostic symptom [e.g., feelings of guilt, sadness, self-confidence and discouragement, loss of interest, crying, changes in appetite, sleep difficulties, suicidal ideation]. A cut-off score of 10 or greater identify the presence of depression. Scores at or above 10 are associated with poorer prognosis, whether for CHD progression  or “hard” medical endpoints such as death or myocardial infarction [36, 37]. Other symptom-based measure of depression used in cardiac patients are the Centers for Epidemiological Studies-Depression [CES-D] scale [38, 39], and the Hospital Anxiety and Depression Scale . To specifically assess exhaustion, the Maastricht Questionnaire can be used . Also is available The Patient Health Questionnaire. The PHQ-9 is a nine-item tool, easy to administer and score. It has been well studied in both screening for and follow-up of depression in primary care [42, 43]. The PHQ-2 consists of the two first questions of the PHQ-9, which deal with mood and lack of pleasure. A cut-off score of 3 or higher has a sensitivity of 83% and a specificity of 92% , fulfilling the need for a quick and reliable depression screening tool. The clinician can also ask for a yes-or-no answer to the two questions of the PHQ-2. A yes to either of the two questions is up to 90% sensitive and 75% specific [43, 45]. Structured interviews are superior to questionnaires in differentiating dysthymia from Minor Depression. Based on the DSM- IV TR criteria, structured interviews have been developed to assess depression as Structured Clinical Interview for DSM-IV TR Axis I Disorders [SCID] and others [for review see ]. Patients with Acute coronary Syndrome [ACS] have many difficulties to emotional tolerate lengthy interviews specifically during the initial brief hospital stays. For this patients are indicated flexible clinical interviews conducted using an expressive-supportive method . The Diagnostic Interview and Structured Hamilton [DISH] incorporates elements of other diagnostic and severity measures of depression, and is well suited for use with this population. It allows to establishment of an work alliance by discussing patient’s emotional experiences. The DISH scoring takes into account symptom severity and duration . The American Heart Association [AHA]  released a consensus document recommending that health care providers screen for and treat depression and anxiety in patients with coronary heart disease. Also Pozuelo and colleagues  recommend that clinicians systematically screen for it in their heart patients, in view of the benefits of antidepressant therapy. Pozuelo and colleagues think that clinicians should routinely screen for depression in cardiac patients and should not hesitate to treat it and eligible patients should routinely be referred to cardiac rehabilitation programs . As commented by Dimsdale  the recent observations on anxiety come at a time when psychiatry is once again redrawing diagnostic guidelines in the Diagnostic and Statistical Manual. To evaluate anxiety, simple screening questionnaires that have high reliability and validity are available. The Beck Anxiety Inventory , the Zung Self-Rating Anxiety Scale , or Hamilton Anxiety Scale  can be used as part of the routine workup of every patient. The Hamilton Anxiety Scale has the advantage of diagnosing depression as well as anxiety . The major disadvantages in using the above scales are the time required for administration [15–25 minutes as part of a full battery], the need for scoring, and significant cost to purchase . A newly useful created instrument, the Psychological General Well Being Index - 6 [PGWBI-6] was designed specifically for the outpatient cardiology setting [54-56] (see Table 1). This is a brief 6-item self-report measure that takes only minutes to perform and is highly correlated with other common scales and screens for anxiety, depressed mood, positive well-being, self-control, general health and vitality. The PGWBI score has shown to statistically be also correlated with cardiac rehabilitation outcome . 1. Have you been bothered by nervousness or your "nerves" during the past month? 2. How much energy, pep, or vitality did you have or feel during the past month? 3. I felt downhearted and blue during the past month. 4. I was emotionally stable and sure of myself during the past month. 5. I felt cheerful, lighthearted during the past month. 6. I felt tired, worn out, used up, or exhausted during the past month. The advantage of the PGWBI-6 is that only 1 scale is required to screen for all of these risk factors, and it can be filled out easily by the patient as part of the initial work up. The results can be quickly analyzed by a nurse or the cardiologist and is available for no charge. These scales provide data that can quickly lead to treatment decisions regarding mental health care. The screening can serve to delineate normal levels of anxiety and depression from more pathologic levels . Because anxiety can have neurobiologic, behavioral, and cognitive/psychologic correlates, it is imperative that cardiologists accurately elicit symptoms of anxiety in the history and via screening that draw upon these 3 domains. The treatment of depression is articulated in three phases: 1) acute phase; purpose: to reduce symptoms [6-12 weeks]; 2) continuation phase; purpose: prevent relapse [4-9 months]; and 3) maintenance phase; purpose: long-term treatment outcome . Pharmacological treatment of depression in patients with CHD is complex and entails certain limitations and contraindications . Table 2 shows the clinical trials of depression therapy in patient with cardiac diseases. Selective serotonin reuptake inhibitors [SSRI] tend to be tolerated better than the traditional tricyclic antidepressants [TCA] . SSRIs have been found effective for treating depression in this population . However, most SSRIs should not be used in combination with class IC anti-arrhythmics and may also potentiate the effects of beta-adrenergic blocking agents. Furthermore, SSRIs appear to reduce depressive symptoms but depression tends not to completely remit in patients with CAD [Coronary Artery disease]. The Myocardial Infarction Depression Intervention Trial [MIND-IT]  looked at whether the antidepressant mirtazapine [Remeron] would improve long-term depression and cardiovascular outcomes in depressed post-MI patients. In 18 months of follow-up, neither objective was obtained. The Cardiac Randomized Evaluation of Antidepressant and Psychotherapy Efficacy [CREATE] trial  tested the efficacy of the SSRI citalopram [Celexa] and interpersonal therapy in a short-term intervention. Here, the antidepressant was superior to placebo in the primary outcome of treating depression, but interpersonal therapy had no advantage over “clinical management,” ie, a shorter, 20-minute supportive intervention . Cognitive behavioral therapy is often successfully used in the treatment of depressive disorders . The main goal of this approach is to modify dysfunctional thoughts and emotions by structured and empathic questioning of patients’ perceptions and thought processes . The typical duration of psychological interventions in CAD patients ranges from 8 to 12 weeks [65-68]. Sebregts and colleagues  intended to develop a relatively short intervention program of 8 weeks, accessible for a large group of AMI [Acute myocardial infarction] and coronary artery bypass grafting [CABG] patients. This intervention explicitly addressed multiple modifiable risk factors. It was directed at the reduction of psychological stress/distress [Type A behavior in particular], the reduction of excessive consumption of dietary fat, elevated serum cholesterol, lack of physical exercise, and although less explicitly—smoking and insufficient social support through the involvement of the patients’ partners in the intervention . The results of this study show that Type A behavior can be reduced in coronary patients through a relatively short intervention program aimed at behavior change and risk reduction. Although No favorable effects were found on depression or vital exhaustion. In view of the findings on the diagnosis of depression, researchers do not unequivocally advise the intervention to the general population of AMI and CABG patients . Other behavioral medicine group programs have attempted to incorporate stress management, relaxation training/cognitive behavior therapy and lifestyle modification for heart disease including Ornish's Lifestyle Heart Trial [70, 71] and the Recurrent Coronary Prevention Project  for reducing Type-A behavior. In the case of the former, actual regression of coronary artery stenosis was achieved in 1-year, and 4- and 5- year follow-up studies in those participants who maintained the lifestyle changes . A recent study of an integrative medicine approach applied to cardiac risk reduction demonstrated that after 10 months of a personalized health plan consisting of mindfulness meditation, relaxation training, stress management, and health education and coaching, patients in the active treatment group had lowered risk, lost more weight, and exercised more frequently compared with the usual care group . Overall behavioral medicine group programs have been shown to reduce the cost of unnecessary medical procedures and work-ups [especially related to anxiety], improve complain with treatment, and reduce the risk factors of stress and an unhealthy lifestyle . As well because these are group interventions this helps patients overcome stigma, social isolation and learn how to better manage their anxiety and depression. Also for anxiety, cognitive behavior therapy, a well-documented evidence-based treatment, should be instituted at the beginning of treatment to ensure that patients understand their condition and that medication management is only one aspect of their treatment . In cognitive behavior therapy, patients are taught to restructure anxiety-provoking thoughts leading to panic attacks, are taught relaxation techniques to counteract stress and anxiety, and are given exposure therapy to desensitize themselves to stressful stimuli. Cognitive behavior therapy is also extremely useful and effective in teaching anger management skills when treating Type A behavior pattern [TABP personality] . Cognitive behavior therapy conveys the message to the patient that it is possible to learn self-management techniques and methods that will most likely allow them to discontinue medications within 6 months to 1 year. Other forms of psychotherapy, such as psychoanalytic, interpersonal, and supportive therapies, can be effective as adjunctive therapies, but do not carry the wealth of evidence-based research demonstrating their effectiveness in the treatment of anxiety disorders. 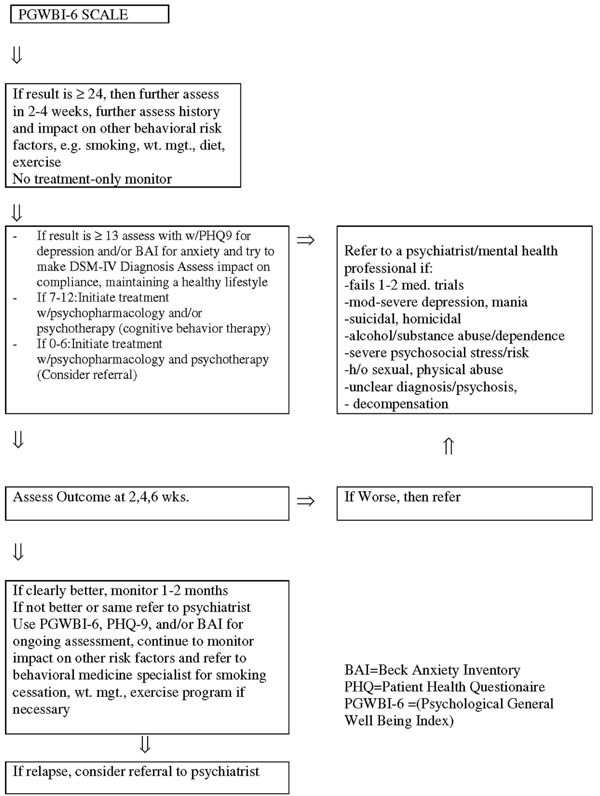 A new proposed anxiety and depression treatment algorithm is based on PGWB initial screening (see Fig. (1)). Anxiety and depression treatment algorithm . As seen in the algorithm (see Fig. (1)), when the screening identifies patients who have more than mild anxiety and depression and have failed 1-2 medication trials, have suicidal or homicidal ideation or a history thereof, alcohol/substance abuse, mania or psychosis, history of sexual, physical abuse, or severe psychosocial distress, a referral should be made to a mental health professional. Integrating ongoing assessments reduces the stigma of mental illness and leads to the greater likelihood of patients receiving adequate mental health treatment. This strengthens the treatment alliance and can improve compliance with medical treatment. Among the psychotherapies, cognitive behavior therapy [CBT] and interpersonal psychotherapy [IPT] are the most effective, in both acute and maintenance treatments . Interpersonal psychotherapy is a time-limited [12-16 weekly 1-hour sessions] manualized psychotherapy that was developed in the early 1970’s by Gerald Klerman and colleagues as a research intervention for outpatients with unipolar major depression . Interpersonal psychotherapy is based on the presumption that interpersonal issues affect mood and mood impairs interpersonal functioning. Interpersonal psychotherapy has been extensively researched and shown to be effective as both an acute and preventive treatment for major depressive disorder . IPT conceptualizes clinical depression as having three component processes: symptom formation caused by biological and/or psychological mechanisms; social functioning [involving, obviously, social interactions with others]; and enduring personality traits . IPT intervenes in symptom formation and social dysfunction but does not address enduring personality traits in view of the time limits of treatment, the relatively low level of psychotherapeutic intensity, the emphasis of treatment on the current depressive episode, and the difficulty in accurately evaluating personality in the midst of an Axis I disorder . The brevity of the treatment imposes a structure that pressures the patient and therapist to work quickly to alleviate depressive symptoms and resolve the current interpersonal crisis linked with the depression, thus discouraging the patient’s becoming dependent on the therapist . For each patient, therapy focuses on one or, at most, two interpersonal problem areas that are identified as precursors of the current depressive episode. These problem areas were derived from extensive research on the role of environmental influences on mood and are characterized as unresolved grief following the death of a loved one, role transitions [difficulty adjusting to changed life circumstances], interpersonal role disputes [conflicts with a significant other] and interpersonal deficits [impoverished social networks]. Maintaining the focus of treatment on a problematic interpersonal issue prevents the therapy from becoming too diffuse and forces the therapist and patient to discuss material that is relevant to the focal area and treatment objectives . IPT also focuses on the “here and now,” that is, on current problematic interpersonal issues that are amenable to change, rather than on reconciling unresolved interpersonal problems having to do with the past. The focus on resolving current interpersonal problems and developing strategies for warding off future problems helps reduce the depressed patient’s tendency to ruminate about past events and experiences that cannot be changed and which only serve to reinforce the patient’s already low sense of self-esteem and dysphoria . The primary goal of IPT is to obtain the remission of depressive symptoms by facilitating resolution of a current interpersonal crisis. At one-year follow-up, patients who received interpersonal psychotherapy had better psychosocial functioning than those who did not receive this treatment . The National Institute of Mental Health Treatment of Depression Collaborative Research Program [NIMH TDCRP] found that, in general, interpersonal psychotherapy is an effective monotherapy for patients with mild to moderate depression, but that antidepressant medication should be used as a first line treatment for severely ill patients. Despite the large amount of evidence supporting significant and independent associations between anxiety and depression and the pathogenesis of cardiovascular disease, the 2010 American College of Cardiology Foundation/American Heart Association Guideline for Assessment of Cardiovascular Risk in Asymptomatic Adults [84, 85] does not consider yet any of them. Further research is warranted to determine factors that may moderate anxiety in order to better understand the phenomenon among acute myocardial infarction patients and develop effective interventions. It appears that anxiety after acute myocardial infarction is a universal phenomenon . Future studies need to disentangle the cause effect relationships between depression, anxiety and adverse health behaviors in patients with coronary artery disease . As commented on by Dimsdale  the recent findings regarding anxiety come at a time when psychiatry is once again redrawing diagnostic guidelines in the Diagnostic and Statistical Manual. For decades, the Diagnostic and Statistical Manual has differentiated between anxiety disorders and depressive disorders but in clinical practice these disorders rarely occur in isolation and the distress associated with them increases synergistically when both sets of symptoms coexist. Future researches should analyze together the two symptoms and their synergic action in heart disease. It would be useful for clinical practice to develop treatments that combine strategies for anxiety and depression and evaluate whether such treatments would reduce cardiovascular risk . Depression can be treated effectively with a combination of psychological and pharmacological interventions . Also anxiety is common among cardiac patients and should be treated to enhance recovery and decrease patients’ risk of subsequent cardiac events. One of the most important areas for future research is elucidating the mechanisms whereby anxiety causes poorer outcomes in acute myocardial infarction patients. The mechanisms [either physiological or behavioral] whereby anxiety is related to poorer short and long term outcomes in acute myocardial infarction patients have yet to be elucidated. Research in this area is important to help clinicians determine the best ways to manage acute myocardial infarction patients to decrease the negative impact of anxiety . In future trials, it is important to pay particular attention to nonresponders to intervention, because these patients have been shown to be at a higher risk of late mortality compared with responders . If we are to continue lowering the rates of CHD, we have to continue to emphasize prevention of the modifiable risk factors. This will require that cardiologists, cardiovascular surgeons and mental health professionals work together to provide comprehensive treatments that address not only CHD but optimize the mental health of patients. Jiang W, Alexander J, Christopher E, et al. Relationship of depression to increased risk of mortality and rehospitalization in patients with congestive heart failure Arch Intern Med 2001; 161: 1849-56. Molinari E, Compare A, Parati G, Eds. Clinical psychology and heart disease New York: Springer 2006. Zuidersma M, Thombs BD, de Jonge P. Onset and Recurrence of depression as predictors of cardiovascular prognosis in depressed acute coronary syndrome patients: A systematic review Psychother Psychosom 2011; 80: 227-37. Janszky I, Ahnve S, Lundberg I, et al. Early-onset depression, anxiety, and risk of subsequent coronary heart disease: 37-year follow-up of 49,321 young Swedish men J Am Coll Cardiol 2010; 56: 31-7. Whang W, Shimbo D, Kronish IM, et al. Depressive symptoms and all-cause mortality in unstable angina pectoris (from the Coronary Psychosocial Evaluation Studies [COPES]) Am J Cardiol 2010; 106: 1104-7. Nabi H, Shipley MJ, Vahtera J, et al. Effects of depressive symptoms and coronary heart disease and their interactive associations on mortality in middle-aged adults: the Whitehall II cohort study Heart 2010; 96: 645-50. Watkins LL, Blumenthal JA, Babyak MA, et al. Phobic anxiety and increased risk of mortality in coronary heart disease Psychosom Med 2010; 72: 664-71. Kubzansky LD, Kawachi I, Weiss ST, et al. Anxiety and coronary heart disease: a synthesis of epidemiological, psychological, and experimental evidence Ann Behav Med 1998; 20: 47-58. Moser DK, De Jong MJ. Anxiety and heart disease In: Molinari E, Compare A, Parati G, Eds. Clinical psychology and heart Disease. Italia: Springer-Verlag 2006. Barlow D. Anxiety and its disorders 1988. Shah SU, White A, White S, et al. Heart and mind: (1) relationship between cardiovascular and psychiatric conditions Postgrad Med J 2004; 80: 683-9. Roest AM, Martens EJ, de Jonge P, et al. Anxiety and risk of incident coronary heart disease: a meta-analysis J Am Coll Cardiol 2010; 56: 38-46. Kawachi I, Sparrow D, Vokonas PS, et al. Symptoms of anxiety and risk of coronary heart disease. The Normative Aging Study Circulation 1994; 90: 2225-9. Rose SK, Conn VS, Rodeman BJ. Anxiety and self-care following myocardial infarction Issues Ment Health Nurs 1994; 15: 433-4. Zafar MU, Paz-Yepes M, Shimbo D, et al. Anxiety is a better predictor of platelet reactivity in coronary artery disease patients than depression Eur Heart J 2010; 31: 1573-82. Fehder W. Alterations in immune response associated with anxiety in surgical patients CRNA 1999; 10: 124-9. Wittstein IS. Depression, anxiety, and platelet reactivity in patients with coronary heart disease Eur Heart J 2010; 31: 1548-50. A.P.A. Diagnostic and statistical manual of mental disorders In: Washington DC 2000. Carney R, Freeland KE, Elsen SA, Rich MW, Jaffe AS. Major Depression And Medication Adherence In Elder Patients With Coronary Artery Disease Health Psychology 1995; 14: 88-90. Frasure-Smith N, Lesperance F, Talajic M. Depression and 18-month prognosis after myocardial infarction Circulation 1995; 91: 999-1005. Kop WJ. Chronic and acute psychological risk factors for clinical manifestations of coronary artery disease Psychosom Med 1999; 61: 476-87. Lesperance F, Frasure-Smith N. Depression in patients with cardiac disease: a practical review J Psychosom Res 2000; 48: 379-91. Roest AM, Thombs BD, Grace SL, et al. Somatic/affective symptoms, but not cognitive/affective symptoms, of depression after acute coronary syndrome are associated with 12-month all-cause mortality J Affect Disord 2011; 131: 158-63.
 de Jonge P, Ormel J, van den Brink RH, et al. Symptom dimensions of depression following myocardial infarction and their relationship with somatic health status and cardiovascular prognosis Am J Psychiatry 2006; 163: 138-44. Smolderen KG, Spertus JA, Reid KJ, et al. The association of cognitive and somatic depressive symptoms with depression recognition and outcomes after myocardial infarction Circ Cardiovasc Qual Outcomes 2009; 2: 328-7. Martens EJ, Hoen PW, Mittelhaeuser M, et al. Symptom dimensions of post-myocardial infarction depression, disease severity and cardiac prognosis Psychol Med 2010; 40: 807-14.
 van Melle JP, de Jonge P, Spijkerman TA, et al. Prognostic association of depression following myocardial infarction with mortality and cardiovascular events: a meta-analysis Psychosom Med 2004; 66: 814-22. Whooley MA, de Jonge P, Vittinghoff E, et al. Depressive symptoms, health behaviors, and risk of cardiovascular events in patients with coronary heart disease JAMA 2008; 300: 2379-88. Compare A, Gondoni L, Molinari E. Psychological risk factors for cardiac disease and pathophysiological mechanisms: an overview In: Molinari E, Compare A, Parati G, Eds. Clinical psychology and heart disease. New York: Springer 2006; pp. 21-32. Kop WJ, Ader DN. Depression in coronary artery disease: Assessment And Treatment In: Molinari E, Compare A, Parati G, Eds. Clinical psychology and heart disease. Italia: Springer-Verlag 2006. Rozanski A, Blumenthal JA, Davidson KW, et al. The epidemiology, pathophysiology, and management of psychosocial risk factors in cardiac practice: the emerging field of behavioral cardiology J Am Coll Cardiol 2005; 45: 637-51. Denollet J, Pedersen SS. Anger, depression, and anxiety in cardiac patients: the complexity of individual differences in psychological risk J Am Coll Cardiol 2009; 53: 947-. Beck AT, Beamesderfer A. Assessment of depression: the depression inventory Mod Probl Pharmacopsychiatry 1974; 7: 151-69. Beck AT, Rush AJ, Shaw BF, et al. Cognitive therapy of depression In: New York: Guilford Press 1979. Carney RM, Rich MW, Freedland KE, et al. Major depressive disorder predicts cardiac events in patients with coronary artery disease Psychosom Med 1988; 50: 627-33. Frasure-Smith N, Lesperance F, Talajic M. Depression following myocardial infarction. Impact on 6-month survival JAMA 1993; 270: 1819-25. Frasure-Smith N, Lesperance F, Talajic M. The impact of negative emotions on prognosis following myocardial infarction: is it more than depression? Health Psychol 1995; 14: 388-98. Radloff LS. The CES-D scale: a self-report depression scale for research in the general population Appl Psychol Meas 1977; 1(3): 385-401. Schulz R, Beach SR, Ives DG, et al. Association between depression and mortality in older adults: the Cardiovascular Health Study Arch Intern Med 2000; 160: 1761-8. Herrmann C. International experiences with the Hospital Anxiety and Depression Scale--a review of validation data and clinical results J Psychosom Res 1997; 42: 17-41. Appels A, Brussels LJWAS. Loss of control, vital exhaustion and coronary heart disease: stress, personal control, and health In: Steptoe A, Appels Ad, Eds. Brussels LJWAS, ed. England: Oxford 1989; pp. 215-35. Kroenke K, Spitzer RL, Williams JB. The PHQ-9: validity of a brief depression severity measure J Gen Intern Med 2001; 6: 06-13. Lowe B, Unutzer J, Callahan CM, et al. Monitoring depression treatment outcomes with the patient health questionnaire-9 Med Care 2004; 42: 1194-201. Kroenke K, Spitzer RL, Williams JB. The Patient Health Questionnaire-2: validity of a two-item depression screener Med Care 2003; 41: 1284-92. Spitzer RL, Williams JB, Kroenke K, et al. Utility of a new procedure for diagnosing mental disorders in primary care. The PRIME-MD 1000 study JAMA 1994; 272: 1749-56. Freedland KE, Skala JA, Carney RM, et al. The Depression Interview and Structured Hamilton (DISH): rationale, development, characteristics, and clinical validity Psychosom Med 2002; 64: 897-905. Maier K, Chatkoff D, Burg MM. Depression and CHD: prevalence, prognosis; pathology and treatment In: Molinari E, Compare A, Parati G, Eds. Clinical psychology and heart disease. Italia: Springer-Verlag 2006. Lichtman JH, Bigger JT Jr, Blumenthal JA, et al. Depression and coronary heart disease: recommendations for screening, referral, and treatment: a science advisory from the American Heart Association Prevention Committee of the Council on Cardiovascular Nursing, Council on Clinical Cardiology, Council on Epidemiology and Prevention, and Interdisciplinary Council on Quality of Care and Outcomes Research: endorsed by the American Psychiatric Association Circulation 2008; 118: 1768-75. Pozuelo L, Tesar G, Zhang J, et al. Depression and heart disease: what do we know, and where are we headed? Cleve Clin J Med 2009; 76: 59-70. Dimsdale JE. What does heart disease have to do with anxiety? J Am Coll Cardiol 2010; 56: 47-8. Beck AT, Steer RA. Manual for the beck anxiety inventory In: San Antonio, TX: The Psychological Corporation 1990. Zung WW. A rating instrument for anxiety disorders Psychosomatics 1971; 12: 371-9. Grossi E, Groth N, Mosconi P, et al. Development and validation of the short version of the Psychological General Well-Being Index (PGWB-S) Health Qual Life Outcomes 2006; 4: 88. Klocek M, Kubinyi A, Bacior B, et al. Effect of physical training on quality of life and oxygen consumption in patients with congestive heart failure Int J Cardiol 2005; 103: 323-9. Manzoni GM, Villa V, Compare A, et al. Short-term effects of a multi-disciplinary cardiac rehabilitation programme on psychological well-being, exercise capacity and weight in a sample of obese in-patients with coronary heart disease: a practice-level study Psychol Health Med 2011; 16: 178-89. Frasure-Smith N, Lesperance F, Prince RH, et al. Randomised trial of home-based psychosocial nursing intervention for patients recovering from myocardial infarction Lancet 1997; 350: 473-9. Roose SP, Laghrissi-Thode F, Kennedy JS, et al. Comparison of paroxetine and nortriptyline in depressed patients with ischemic heart disease JAMA 1998; 279: 287-91. Nelson JC, Kennedy JS, Pollock BG, et al. Treatment of major depression with nortriptyline and paroxetine in patients with ischemic heart disease Am J Psychiatry 1999; 156: 1024-8. Berkman LF, Blumenthal J, Burg M, et al. Effects of treating depression and low perceived social support on clinical events after myocardial infarction: the enhancing recovery in coronary heart disease patients enrichd randomized trial JAMA 2003; 289(23): 3106-16. Glassman AH, O'Connor CM, Califf RM, et al. Sertraline treatment of major depression in patients with acute MI or unstable angina JAMA 2002; 288: 701-9.
 van den Brink RH, van Melle JP, Honig A, et al. Treatment of depression after myocardial infarction and the effects on cardiac prognosis and quality of life: rationale and outline of the Myocardial INfarction and Depression-Intervention Trial (MIND-IT) Am Heart J 2002; 144: 219-5. Lesperance F, Frasure-Smith N, Koszycki D, et al. Effects of citalopram and interpersonal psychotherapy on depression in patients with coronary artery disease: the Canadian Cardiac Randomized Evaluation of Antidepressant and Psychotherapy Efficacy (CREATE) trial JAMA 2007; 297: 367-79.
 van Melle JP, de Jonge P, Honig A, et al. Effects of antidepressant treatment following myocardial infarction Br J Psychiatry 2007; 190: 460-6. Dusseldorp E, van Elderen T, Maes S, et al. A meta-analysis of psychoeduational programs for coronary heart disease patients Health Psychol 1999; 18: 506-19. Linden W. Psychological treatments in cardiac rehabilitation: review of rationales and outcomes J Psychosom Res 2000; 48: 443-54. Linden W, Stossel C, Maurice J. Psychosocial interventions for patients with coronary artery disease: a meta-analysis Arch Intern Med 1996; 156: 745-52. Sebregts EH, Falger PR, Bar FW. Risk factor modification through nonpharmacological interventions in patients with coronary heart disease J Psychosom Res 2000; 48: 425-1. Sebregts EH, Falger PR, Appels A, et al. Psychological effects of a short behavior modification program in patients with acute myocardial infarction or coronary artery bypass grafting: a randomized controlled trial J Psychosom Res 2005; 58: 417-24. Gould KL, Ornish D, Scherwitz L, et al. Changes in myocardial perfusion abnormalities by positron emission tomography after long-term, intense risk factor modification JAMA 1995; 274: 894-901. Ornish D, Brown SE, Scherwitz LW, et al. Can lifestyle changes reverse coronary heart disease? The Lifestyle Heart Trial Lancet 1990; 336: 129-33. Friedman M, Thoresen CE, Gill JJ, et al. Alteration of type A behavior and its effect on cardiac recurrences in post myocardial infarction patients: summary results of the recurrent coronary prevention project Am Heart J 1986; 112: 653-. Ornish D, Brown SE, Billings JH, et al. Can lifestyle changes reverse coronary atherosclerosis? Four year results of the Lifestyle Heart Trial, (abstract) Circulation 1993; 88: 385. Edelman D, Oddone EZ, Liebowitz RS, et al. A multidimensional integrative medicine intervention to improve cardiovascular risk J Gen Intern Med 2006; 21: 728-34. Hellman CJ, Budd M, Borysenko J, et al. A study of the effectiveness of two group behavioral medicine interventions for patients with psychosomatic complaints Behav Med 1990; 16: 165-73. Barlow DH, Gorman JM, Shear MK, et al. Cognitive-behavioral therapy, imipramine, or their combination for panic disorder: A randomized controlled trial JAMA 2000; 283: 2529-36. Otto MW, Pollack MH, Sachs GS, et al. Discontinuation of benzodiazepine treatment: efficacy of cognitive-behavioral therapy for patients with panic disorder Am J Psychiatry 1993; 150: 1485-90. Hollon SD, Munoz RF, Barlow DH, et al. Psychosocial intervention development for the prevention and treatment of depression: promoting innovation and increasing access Biol Psychiatry 2002; 52: 610-30. Klerman G, Weissman M, Rounseville B, Chevron E. Interpersonal psychotherapy of depression In: New York: Basic Books 1984. Weissman MM, Prusoff BA, Dimascio A, et al. The efficacy of drugs and psychotherapy in the treatment of acute depressive episodes Am J Psychiatry 1979; 136: 555-8. Koszycki D. Interpersonal psychoterapy for depression in patients with coronary heart disease In: Molinari E, Compare A, Parati G, Eds. Clinical psychology and heart disease. italia: springer-verlag 2006. Weissman MM, Markowitz JC, Klerman GL, et al. Comprehensive Guide To Interpersonal Psychotherapy 2000. Weissman MM, Klerman GL, Prusoff BA, et al. Depressed outpatients. Results one year after treatment with drugs and/or interpersonal psychotherapy Arch Gen Psychiatry 1981; 38: 51-. Greenland P, Alpert JS, Beller GA. ACCF/AHA guideline for assessment of cardiovascular risk in asymptomatic adults: a report of the American College of Cardiology Foundation/American Heart Association Task Force on Practice Guidelines J Am Coll Cardiol 2010; 56: e50-103. Greenland P, Alpert JS, Beller GA, et al. 2010 ACCF/AHA guideline for assessment of cardiovascular risk in asymptomatic adults: a report of the American College of Cardiology Foundation/American Heart Association Task Force on Practice Guidelines Circulation 2010; 22: e584-636. Frasure-Smith N, Lesperance F. Depression and other psychological risks following myocardial infarction Arch Gen Psychiatry 2003; 60: 627-36. Carney RM, Blumenthal JA, Freedland KE, et al. Depression and late mortality after myocardial infarction in the Enhancing Recovery in Coronary Heart Disease (ENRICHD) study Psychosom Med 2004; 66: 466-74.